Today is a sad day. I find it too bad that after a long absence from the farm journal I return with such an opening. It was and has been a busy through late spring, summer and so far this fall. In the middle of busy days, something I enjoy is left undone, and too often, it was the garden. I never felt like I got enough time in the garden. That is why, though this day comes around every year, it is a little sadder than most years. We had a heads-up the first fall freeze would occur last night. Over the weekend, we pulled what peppers, green tomatoes, and other vegetables there were left out of the garden. However, with the end of the yearly garden (though we have potatoes still in the ground and still need to harvest what is left of them) is the end of fresh vegetables for another year. Sure, some of our friends live on land a little higher (in elevation) than ours and we might get another butter-squash or two, but there is a lot of cold between now and the next garden. Yet, I reckon, even thought there is a bit of sadness with the first freeze, it was not hard and deep, which allow a few more days…maybe weeks?..of those flowers who seem to power through these early frosts and continue to give beauty and in their color a reminder of days that have been and of days to come. Whose Story should We Listen To? This morning the full moon reflects white from the sun while at the same moment the mountain’s snow reflects peach colors from the rising sun. Two massive forms of creation speak two stories of the same light rolling over the eastern horizon. I find it curious and good how the created birds, mountains, wind, and deer can experience the same sun yet have much different experiences. Hay holds many experiences these days. With rain on and off over the last three weeks everyone is trying to find the right time to cut, dry, bale, and load hay out of the fields. To get hay off a field without any rain has been near impossible. This holds true for us. We did not cut all the fields at once, but left a gap hoping some would be harvested without rain. Didn’t happen. Instead we found ourselves picking up the early cutting hay yesterday, which had caught rain last week, as the sky over the southern ridge spoke of rain. As we loaded one bale after the next onto the flatbed trailer, the clouds deepened and soon there was little doubt we would hear rain soon. As we backed a full trailer into the barn, rain began to fall. Our hope was a light sprinkle that could easily dry the next day. There rain said a little more than we cared for. This morning, though, I wonder who listened to the same rain and heard a song of joy, or wonderment, or laughter? I imagine grass roots and rain danced yesterday. Perhaps the local mallards in the creek sang along. I wonder if this morning’s relationship between the mountain, moon, and sun call for another hearing of rain. Might be, it is best to put my own story off to the side for a moment and take the time to hear or at least imagine other stories creation might tell of yesterday’s rain. Having cut hay the other day and then having rain most days since, I probably should feel unhappy. I cannot say at times I do not. Yet, something about rain this time of year is special. Moderate temperatures, clouds and midst settling into the hollows of the ridge, the sharp line of the ridge against clouds moving high above, makes one settle down for a moment and enjoy the smell of damp earth. Where the grays of midst and clouds, the browns of the ridge, and the golds of grasses don’t get it, then there is the bright flowers of garden and flower beds calling for attention and a moment, a bit of silence, and shear enjoyment. Venus is just to the south of Pahto and even with her peak when I shut down the tractor and finished baling for the evening. 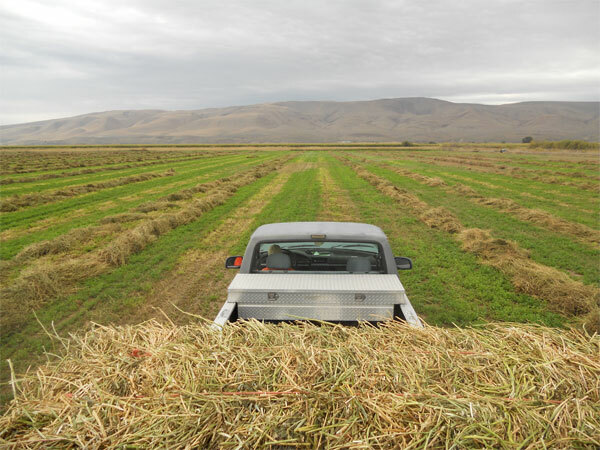 Forty bales of Alfalfa and about the same of orchard grass sat in the field in the moonlight as the tractor and baler wound down. Stars, moon, and planets help give a magical feel to the air as I walked from the field to the house. A wonderful way to end the day. Today, though, with nearly a hundred bales in the field it is time to pick them up and stack them for the winter. Our charity for the month is Noah’s Ark homeless shelter in Wapato. Anyone who would like to help move bales from the field to the stack is welcome to come by (please call first) and help. We will donate $.75 for every bale (the cost of having someone pick up bales) picked up and stacked to Noah’s Ark. Tomorrow evening we are baling hay. Of course, once the hay is baled someone must pick it up out of the field and stack it. Normally we have someone come to the farm with a bale wagon and mechanically pick up and stack each bale. Great on our backs, but it does cost us money. Now, here is our incredible offer to you! If we can get a group of folks to the farm Tuesday evening to help load bales out of the field and stack them, then we will donate 75 cents to Noah’s Ark for every bale stacked! (Noah’s Ark is the only homeless shelter in the entire lower valley. Donations are hard to come by these days and it is important to make sure they are around come winter when the temperatures are in the single digits!) That means other than the cost of tractor time, all the money we normally pay someone to ease the strain on our backs will go to the homeless of the lower valley! So, here’s the deal. We will begin at 6pm Tuesday evening loading bales. Eat well before you come and bring some fruit, drink, desert, etc. We’ll then load bales. After we’re all done we’ll sit in the cool evening breeze, admire our work, congratulate one another on making a donation possible, have some desert and watch the sun set! We need to make sure we have enough people to make this a go. Email me at dave@justlivingfarm.org and let me know you are coming. If enough folks email by 7pm Monday evening we’re on for Tuesday evening. If not, we will give it another try with the next cutting. In either case, I will let everyone who responds know what is going on with a Tuesday morning email. What Does Friedrich Nietzsche Know about Baling? I really don’t buy Friedrich Nietzsche’s quote, “That which does not kill us makes us stronger,” or for that matter the often attributed but actually not Christian text, “God only gives you what you can handle.” It isn’t that these sayings might be helpful to some in times of difficultly. If thinking or believing one might become a better person or are a better person for sojourning days of unavoidable hurt and such belief gets one through painful times, I have a hard time knocking it. My fear is when one dies on the journey; others might choose to believe they just were not strong enough. And the theology that God would choose to make one suffer because one can handle it is questionable at best. However, there is appropriateness to acknowledging difficult situations come up in our lives and sometimes we get hurt—these events seldom make us stronger; but rather than a God giving us hurt as if it were a Christmas gift, a kind and gracious God is in the midst of our hurt helping us live through it. But then again maybe God has a sense of humor and enjoys nudging us (or maybe it’s just me) a little. I began baling grass hay the other day and let’s say it didn’t go as smoothly as I would like. That’s to say the baler wasn’t baling. One or two bales would land out the back of the baler and then the next two or three would miss a tie and bust when they hit the ground. I’d take the baler in, adjust it, and head out to the field and try again. Only to watch bales come out the back in of the baler and fall apart, again. Now this occurred more than once and after a while, I started feeling like what came out the back end of the baler was the same as what comes out the back end of an animal after digesting the same hay going in the front end. After being taken to the brink of madness (I know, some would say that wasn’t too far of a trip. ), the field got itself baled. Come to think of it though, in hindsight, maybe I’m a little stronger for it! After all, the experience didn’t kill me! Yep, I think due to all that climbing on and off the tractor, walking to the baler, and making adjustments, walking back to the tractor, my legs are stronger! My stamina is buffer! My patience and resolve is tougher more resilient! In fact, I wouldn’t be surprised at all, now, that when I climb into the tractor cab and see baling twine, from all those busted bales, piled next to the seat I will think, “Yep, I am fortunate! God didn’t give me any more than I could handle!” Then again, maybe God just wants me to talk a little more with my neighbors and learn how to bale grass! Walking out the door in the early morning to rake hay with the morning dew has a number of upsides. There is something about heading out of the house while others are sleeping. There is comfort in knowing there is peace in the cool morning. As hay winds itself off the end of the rake with a rousing sunrise over the northeast ridge one can only wish, maybe even pray, the sleep of all creation could be as peaceful as it is on a July morning in the landscape of this valley. Years ago folks came to the Farm from Pacific Grove, California. We spent time with them at another farm that had a number of different types of willows. We trimmed branches, brought them back to the Farm, and placed them in five-gallon buckets of water. Most of the willows on the Farm are from that day. Now, each year we take a moment and trim our own willows, place them in a bucket and then transplant them once their roots have developed and the weather is good for transplanting. It doesn’t take much time and we figure it must help in our carbon footprint! Are you interested in estimating your carbon footprint? Try The Nature Conservancy’s footprint calculator at http://www.nature.org/initiatives/climatechange/calculator/?gclid=CMyMh8SpzaICFQxubAodDhxkwQ. We got a late start but our beans are up. The ground where they are planted is marginal and we wonder how they will do. By planting multiple bean types, we hope to get an idea of what might do best in the soil of this area of the farm. So far Pinto’s and Red’s are doing well with about eighty percent germination. We will wait and see how others are doing after we give them a little more time. The alfalfa is now down. The grass field will go a little longer before we cut it for hay. The forecasted temperature is for seventies and eighties this week, so the hay should dry down fine. If temperatures and wind stay as forecasted baling should begin mid to late week.